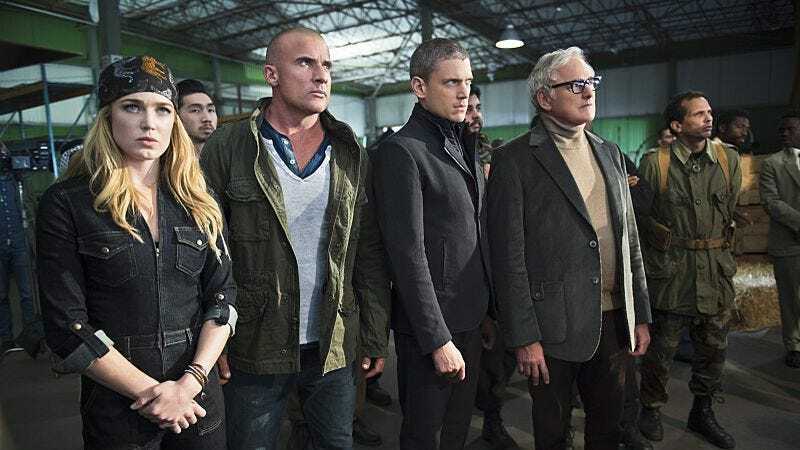 Rip Hunter’s team of time-displaced heroes and villains takes the fight to Vandal Savage in the second part of the DC’s Legends Of Tomorrow pilot, an episode that sees the show settling into its concept but still holding on to some of the main flaws of its debut. There’s much less of the clunky exposition (although there’s still some), and the action is bigger in this second chapter, which begins and ends with explosive, effects-heavy fight sequences that reaffirm the series’ commitment to delivering a blockbuster product on a network TV budget. Unfortunately, the character development continues to be underwhelming, and the more intimate, personal moments in this episode largely fall flat. In the case of Kendra and Carter, that lack of emotional weight is a result of them being thrown into an epic, millennia-spanning romance before they established their own individual characters, and now they’re dealing with the death of their son from a past life on top of all that. These two characters are largely isolated from the rest of the cast in this episode, and it feels like they’re off in their own separate, less entertaining show. While this episode does have Kendra expressing her disdain for being forced into a situation governed by fate rather than her individual choice, any hesitation Kendra has is wiped away by the end of the episode, when she finally remembers her past lives and eternal love for Carter just in time to watch him die his latest death. So much of Carter and Kendra’s story in this episode revolves around mystical nonsense about ancient daggers and magical incantations, and the writers do the bare minimum when it comes to actually creating an emotional connection between the lovers. It’s unrealistic to expect Kendra to suddenly fall for Carter because destiny demands it, and it’s unrealistic to expect viewers to invest in this romance because it’s been around for thousands of years that the audience hasn’t seen. It doesn’t help that Falk Hentschel and Ciara Renée have very little chemistry together, but it makes sense that the actors wouldn’t connect when the characters are still so ill-defined. Hentschel gives an especially lifeless performance—his supposedly mournful delivery of “He was our son” is pitiful—so it’s actually a relief when Vandal Savage kills Carter at the end of the episode. Maybe now this means Kendra will get the chance to create her own identity, although the ending suggests that now she’ll be hung up on Carter’s death since her memories returned. “Pilot, Part 2” establishes how much the team needs Rip’s time-traveling expertise by having Rip stay out of the action for the most part, hanging out in the Waverider and only stepping in when the team makes mistakes, which they do often. The two big screw-ups are Martin Stein, whose arrogance reveals to Vandal Savage that they are time-travelers and turns a nuclear bomb auction into a high-stakes standoff, and Ray Palmer, who loses a piece of his future tech in that standoff that could have disastrous consequences on the timeline. Palmer’s inferiority complex is beginning to make more and more sense as we see how lousy he is as a field agent, but Brandon Routh’s performance makes him an endearing character. He also has some strong moments with Leonard Snart when they find themselves imprisoned after trying to steal from Vandal Savage, and the mixing and matching of different personalities is proving to be very interesting. The way Leonard Snart makes light of being used as a child to help his father during burglaries shows how he dulls his past trauma by assuming a superior, aloof attitude, and the over-the-top theatricality of Wentworth Miller’s performance is part of the behavioral mask Leonard wears to hide his internal conflict. There’s a complexity to Miller’s performance that isn’t found in his villainous co-star Dominic Purcell, but that’s part of why they make such a good pair. They’re a study in contrasts, and while Leonard is easily the more captivating character, their dynamic together has the most chemistry of this show’s three major partnerships. Martin gets the other big personal revelations this week when he interacts with his 25-year-old self to track down Ray’s stolen tech, and while the time-travel mechanics will make your head spin if you think about it too hard, the Martin plot is a lot of fun. Sara and Jax join Martin to serve as intermediaries because interacting with your past self can have unforeseen ramifications (like everything else in time travel), and the episode mines a lot of humor from their reactions to the young Martin, an arrogant stoner with a thing for hot blondes. Franz Drameh’s performance really benefits from having more screen time with Caity Lotz and Victor Garber’s confident characterizations, and the silent interactions Jax shares with Sara as they witness the spectacle of the Martins Stein bring his character to life. Lotz continues to be this show’s MVP, and of all the actors, she’s the one that best embodies the playful tone this show is aiming for. It looks like she’s having so much fun, and why wouldn’t she? Her job is playing a time-traveling superhero that gets to beat people up in period dress, and that glee carries over to Lotz’s performance, resulting in a brighter, cheerier Sara that is a delight to watch. She’s incredibly charming when she’s flirting with young Martin, and the small moment where she flashes a giddy smile to older Martin after grabbing a joint from his past self is a perfect example of the attitude that makes her so engaging. Sara never fails to impress, and even though she’s stoned, that doesn’t stop her from accomplishing the team’s mission of retrieving Ray’s technology single-handedly. Meeting his younger self forces older Martin to come to terms with the negative personality traits that have stuck with him his entire life, and while Victor Garber captures the emotional impact of these revelations, the resolution of this plot is very forced. To lift Martin’s spirits, Jax tells him that he’s smart, kind, and selfless, which is a real stretch coming from a guy that was recently roofied by Martin, kidnapped, and sent backward in time against his will. The show completely ignores the horrible things Martin did, and he should be forced to suffer through his identity crisis if it means a change in his behavior. Legends Of Tomorrow’s pilot ends with the team still stranded in 1975 and down one member, and shaving down the expansive ensemble is a smart decision. Carter’s death doesn’t hit especially hard given his bland character and the fact that we know he’ll be back, but it ups the stakes moving forward by establishing the danger of this mission. There’s still plenty of room for improvement with the characters, but the pilot does strong work establishing the scope of the series and embracing the often far-fetched fun of superhero narratives, making it a worthwhile start to the CW’s most ambitious superhero series yet. Having Damien Dahrk appear in this episode is a fun shout-out to what’s currently going on in Arrow, but having Neil McDonough share the scene with Casper Crump draws attention to the diminished presence and authority of Vandal Savage. He kills one of the main characters in this episode, and yet he’s still not very intimidating. Brandon Routh’s tactic for selling his technobabble dialogue is performing it with exaggerated enthusiasm, and while it reads as very goofy, it does keep scenes chugging along without a dip in momentum. Sara Lance pronounces “nuclear” as “nucular” because she doesn’t play by anyone’s rules! The first part of the pilot did a good job of using music specific to 1975, but the second part screws up by using “Disco Inferno,” which wasn’t released until late 1976. Leonard Snart saying “feathered friends” is my new happy place. This week in ’70s fashion: lots of turtlenecks, huge collars, and flared pants. It sure is handy that the Waverider has a room that makes clothes! “I’m Arab. 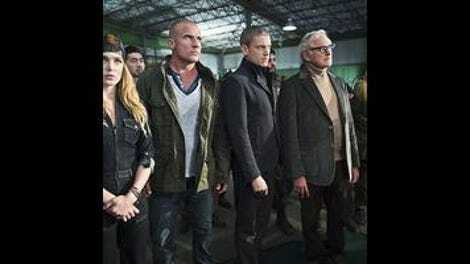 On my mother’s side.” Could this be a hint that Leonard Snart shares Wentworth Miller’s biracial background? His father and sister on the show are white, so at this point it’s still a mystery.